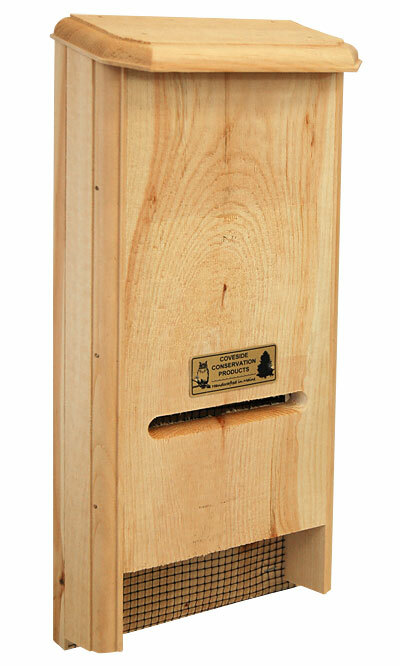 Offer male bats a comfortable roost with the Coveside "Bat"chelor Pad Bat House. Bats tend to separate by gender, with females and children in a larger house, called a nursery, and the males in a smaller home, called a bachelor pad. This house features a 1.25" deep chamber and offers room for up to thirty bats, the perfect size for the males of a colony. The rough sawn wood construction enables bats to better grip the interior. Black plastic screening on the interior of the chamber offers places for them to cling and rest, and the thick sides keep the house warm. An echolocation slot on the front of the item helps bats return to the roost, and the sloping roof prevents water from leaking into it. Crafted from solid eastern white pine, this house will age to a beautiful silver color over time, without painting or staining it. Mount this house on a pole, post, or building with the included hanger, ten to fifteen feet high for better occupancy rates. Bring bats into your yard with the "Bat"chelor Pad Bat House. Made in the USA from solid eastern white pine.